People look odd. Not all people of course. On wedding days people stop looking quite as odd as they do on other occasions. Part of the reason for this might be that when I point my lens at wedding folk they do their best not to look like total freaks. Sometimes it works! The truth is that sometimes when people think they’re giving me their best side, pout, gurn, whatever, they’re perhaps not coming across in the way they think they might be. As I sift through the vast archives I’ve built up over the years it occurs to me that most people are at their best when they don’t know they’ve got a camera point at them. Shove a big ole Nikon in their face and a lot of people do things that are, well, if not odd then certainly a little misguided. I started my photographic career doing candid street photography in Toronto. I learned that when people are at their most natural they look their best. There’s a certain amount of posing that needs to happen if you’re in front of the lens at a wedding, but taking it from me, being relaxed and natural will always make you look cooler, sexier, prettier and more photogenic than if you choose a face that you think will look good. There are of course exceptions to this rule. I’ve seen some faces that only a mother could love. When those faces belong to the groom I know the marriage is going to be a good one. Brides, without fail, and without exception always look astonishing. There’s a lot of support to help brides look their best on their big day. The most grooms get is a best man shoving an electric shaver in their hungover face. If they’re lucky. So after years of being a wedding photographer I started to wonder what would happen if I flipped things on their head. What would happen if instead of encouraging folk to look their best, I goaded them into looking their worst? I decided I had to find out. I’ve seen plenty of hilarious horrors thanks to my photo booth. But what would happen if I asked people to give me their worst face while I was capturing their portrait? The answer to ‘what would happen’ is of course hilarity. In addition to my usual sumptuous photo print options I’m really pleased to announce that I now offer something that might (perhaps unkindly) be called ‘ugly cards’. If you so desire it (and you should) I’ll take a heinous individual portrait of each of your guest. I’ll encourage them, using my natural jerk talent, to pull the ugliest face they can. The fun doesn’t stop there; I’ll send you a pack of cards. Not any old cards, and certainly not the sort of playing cards bought by rough lads on a stag do, I’ll send you a pack of neat, nicely printed set of guest cards. In your set of cards you’ll find an individual card for each of your honoured guests. 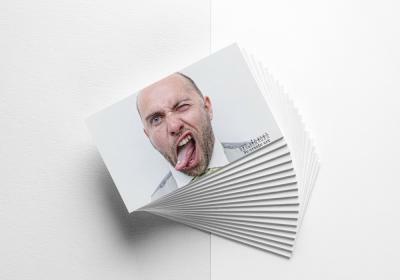 A set of ugly cards to remember each and everyone of your guests will be a unique, and potentially hilarious reminder of the best day of your life. And potentially great blackmail fodder when you call on your guest for babysitting duties in the future.